There are many complex economic, environmental, and safety factors that will dictate the future growth of LNG. The recent growth in the liquefied natural gas market, including new proposals for both production and receiving facilities, as well as increased LNG shipbuilding, indicate that liquefied natural gas will most certainly play an important role in the future global energy market. As demand for natural gas increases, the shipbuilding industry will adjust accordingly to ensure that the LNG fleet is able meet the needs of emerging liquefied natural gas markets. Currently, there are more than 180 LNG ships with about 110 more being built. Each year the demand for energy throughout the world increases drastically. This is especially true in the United States, where energy demand accounts for the majority of worldwide oil consumption. It is well known that the growing energy use is rapidly depleting the world's oil reserves, and, as a result, the oil production in many of the most prosperous oil fields is on the decline. With the demand for energy increasing and the supply of oil decreasing, other energy options need to be considered. 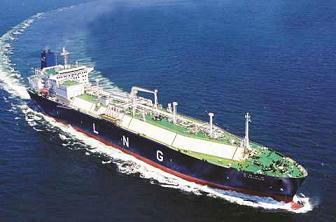 One alternative energy source is liquefied natural gas (LNG). Liquefied natural gas has a small role in today's energy market, accounting for less than 10 percent of the market. However, with the discovery of new natural gas reserves and the evolution of LNG shipping capabilities, it is likely that the LNG market will continue to grow in the future. LNG carriers are constructed with expensive cryogenic containment systems that are necessary to transport the natural gas in its liquid state at a temperature of -261 degrees F. However, the evolution in LNG technology is helping to reduce the construction costs. These expensive ships are constructed for use on dedicated shipping routes, with contracts that last for as long as 20 years. This differs from the oil market, where conventional oil tankers are built on speculation. These dedicated LNG shipping routes run strictly between the LNG production facility and a marine receiving terminal. Most liquefied natural gas carriers are owned by companies that own either the LNG liquefaction facility or the LNG receiving facility. Operating these LNG carriers on routes dedicated to guaranteed contracts helps to minimize the financial risks involved and provides a stable market for both the facility and ship owners. Vessel owners are increasingly considering LNG as a replacement fuel to marine diesel and heavy fuel oil, also called bunker fuel. Emissions regulations that take effect in 2015-16 will make diesel and fuel oil operation more costly. The abundance of shale gas production in North American has made LNG cheaper and cleaner. Several fleets are working on LNG-fuelled vessel designs. To judge the proposed designs, the USCG intends to use International Maritime Organisation (IMO) guidelines, which are drawing from lessons learned in Norway. Carbon emissions have long been a concern there, spurring many several to adopt LNG as fuel. The Commander told a packed room at Zeus's First Annual World LNG Fuels Conference on 26 January 2012 that operators considering LNG should start consultations early to avoid delays. Fuel tank placement is a special concern. Plans for new LNG infrastructure, marine terminals, and gas carriers are growing, along with the increasing demand for natural gas throughout the world. In the near future it is predicted that the size of LNG ships will increase, while the cost of construction will continue to decrease. It appears that, as the future LNG markets expand throughout the world, the liquefied natural gas trade routes will evolve and become more flexible. It is likely that the newer LNG carriers will no longer be bound to long contracts that service only dedicated routes. The future LNG trade may involve carriers that are hired as needed to service emerging LNG production facilities and LNG marine terminals throughout the world. The future of LNG will be driven by the necessity to supplement declining oil reserves and the push for cleaner power generation throughout the world. The level to which the worldwide LNG market will grow still remains unclear. How LNG is transported ? Is it safe ? Why initial cooling of cargo tanks required prior loading LNG cargo ?